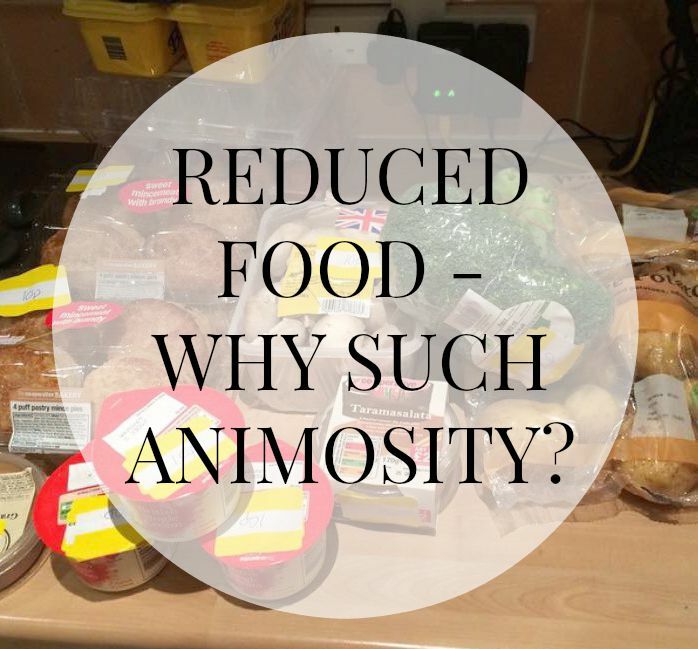 Reduced Food – Why Such Animosity? I don’t know about you but I love visiting my local shops when I know the food is about to be reduced. It also helps that my Mum works in the local shop and if I am not down there when stuff is being reduced and she is finishing her shift, she will pick up some stuff for us that she knows we like. What I don’t understand is the animosity reduced food receives – as if it’s poisonous! Do people not realise that this food is reduced because its best before date is about to expire – which means IT IS STILL IN DATE, PEOPLE. Some seem to think that reduced food means that its gone off and that it will make you ill but really, how silly you can be? Shops can’t sell anything that is out of date which is why they reduce it. They would rather sell it for pence than throw it away – at least they’ve made a sale then! Another thing some people fail to realise is that best before dates often don’t mean much. Most people I know do the egg test when using eggs past their expiry date and don’t worry about that but worry about eating reduced food – where is the logic in that? Eggs are probably one of the food items that would make you most ill if they had turned! Of course, take the expiry date into account but use your eyes and your nose. If it smells okay and looks okay, it probably is okay. So what if that cheese is a day past its sell by date? As long as its not gone off or mouldy, why waste the money you spent on it (and let’s face it, cheese isn’t always cheap) by throwing it away? Image used with permission from Emma at www.fromalditoharrods.com. Edited by me. I often buy reduced food and stick it in the freezer – it is then good for another month. My uncle actually really likes these quiches that the Co-Op sell but they are so expensive. He lives near Clacton so when my mum sees one reduced to mere pence, she picks it up for him and freezes it until he comes down next. He gets a treat that he loves and she doesn’t break the bank buying it. I’m glad that I’ve taught Jack to be careful with his money when it comes to shopping. If he has pennies to spend, he always weighs up his options carefully but I have also taught him to spot a bargain. He knows where the reduced food is stored in our local shop and will often pootle off to that area before calling out to me that he’s found something we should get. When they are selling beef joints, gammon steaks, sausages and the like for mere pennies when they’ve still got a day or two on their expiry date, I am hardly going to refuse, am I? In this day and age, I have to be careful with our food budget – especially with two fusspots – so if I can cut costs on my grocery shop, that’s what I am going to do. I even face animosity in my own home about it. Steve will eat reduced food but he will moan about it – so now I tend to peel off the stickers of food before making it. He can never tell the difference and we get a nice meal that hasn’t broken the bank. Do you buy reduced food? Do you understand the animosity towards purchasing items at a lower price that are about to expire? Surely in this tough climate its something we should all be doing? I really enjoyed this post. I love getting a bargain, and buying reduced food is one way of doing this! If you go to the supermarket at the end of the day they will be marking down perishable items such as fruit, veg, bread etc which sometimes has a few days left or can be frozen. Sell By and Best Before dates don’t mean much, they literally mean the product is at its best before that date but can still be eaten after it! Use By is a bit more strict, but you can still usually get away with eating something a day or two after its use by date and I often do, after checking that it’s still looking and smelling ok.
And you’re right, eggs are one of the foods you shouldn’t really eat after their expiry date because they could potentially make you ill! People are strange. Buying reduced food is a great idea for people on a budget who still want to eat well but can’t necessarily afford to buy fresh produce all the time. Our co-op reduces mayo and spaghetti when it still has months (or even a year or so) left on its best before date! it really is a goldmine in there i can rely on there being choco leibenz biscuits, spaghetti, a few baking bits and some tea/coffee on the main reduced section and then loaves of bread/crisps etc by the till!